As diving consists of swimming underwater, the movements done within the water work your body more than it does above. In order to greatly improve your strength, the resistance of the sea acts as a barrier which makes your muscles work harder to get to what they need to achieve. Teamed with this, the act of swimming beneath the sea enables your muscles to not only work more intensely, but to elongate your limbs, thus boosting your flexibility. Your breathing is also benefited by the sport as while under the water you are forced to breath slower and deeper, which in turns helps you gain a better control over your lungs’ capacity. By keeping a steady breathing pattern it reduces the risk of lung expansion injury. It can also aid in the reduction of mucus on the lungs. On initial interaction with the water, our heart rate may spike, which will cause your blood pressure to rise a little. This could be down to various reasons such as your adrenaline pumping or even the sheer shock of the water temperature. However, once acclimatized to our surroundings, your heart rate and blood pressure will steady out. Also, the aforementioned slow and deep breathing will aid in the reduction of blood pressure. It is believed by scientists that the feeling of being underwater subconsciously takes us back to when we were a baby in the womb. This in turn makes you feel secure and peaceful. The overall experience of being in the water can do wonders for your mood and emotional state. And it also comes with a bonus of being able to watch marine life in their natural habitat, up close. Also the breathing technique discussed earlier is similar to that which is used when you meditate, this therefore helps you to relax and take some time out from everyday tasks, bringing your stress level down. As well as positive effects on your health, deep sea diving can also have some negative effects if not thought through and carried out properly. Below we will look at the certain medical conditions which would require you speaking to your doctor before embarking on your underwater adventure. And any risks that this activity can have on your body if the worst is to happen. Due to the fact that the initial jump into the water spikes your heart rate before lowering it greatly, this could have an impact on your blood pressure. If you currently are suffering from high blood pressure it is strongly recommended that you pay a visit to your doctor before considering diving. They will be able to advise if they think that this sport is suitable for you in your condition. 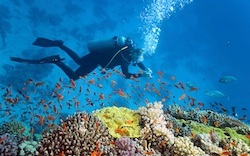 Pulmonary barotrauma is a well known risk for divers. What this is, is the tiny fragile air sacks called alveoli are expanded and over stretched with air, and unfortunately burst. This then sends the air trapped inside the sacks around the body which could cause further damage. Three main reasons why this could occur to you when diving is if you hold your breath while descending through different levels of pressure. It also can happen when a fast diver speeds down their descent. And finally, those with a pre-existing respiratory condition are more at risk of this, so if you suffer with any illnesses such as asthma, you would need to consult with your doctor before going diving. The sea water contains a lot of salt, which can cause dryness and irritation. If you have been underwater for a long period of time, you would need to drink an adequate amount of water when you come back up. By doing this you are preventing dehydration from occurring. If you are wanting to take up deep sea diving, it is most definitely worth attending classes before taking the plunge. This will therefore help you get to grips more with what you can expect from the sea and things you would need to consider. All you would need to do to find an institution near you that runs these types of classes is to have a browse online. Most places offer a variation in courses depending on if you are a complete beginner or just want a refresh. Introductions to the world of deep sea diving are held in a pool or sheltered water which means that you can get the practice in before coming into contact with the ocean. This is a perfect way to start for beginners as they are able to explore the basics in a controlled environment. When it comes to learning to dive, most trainers would have their own equipment so it is not like you would need to rush out and buy all the gear ahead of time. However, if you wish to take your own gear a mask, fins and snorkel would suffice, but it would be worth checking with your instructor first. For beginners, you can choose to wear a bathing suit and an optional t-shirt if you wish, however more advanced divers may already have access to their own wet suit. 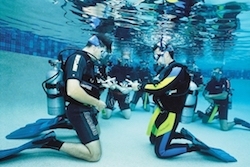 Depending on the diving school, the prices per session may vary so it is certainly worth having a look around all of your local venues to get you the best quality training which won’t break the bank. Is Deep Sea Diving for You? In conclusion, deep sea diving has many different benefits to your body from stress relief to lowering blood pressure. However, it also has its drawbacks, such as certain medical conditions being affected like asthma and high blood pressure. After taking a look into this adventurous activity further, we are able to conclude that, as long as you seek medical advice beforehand and are given the OK, you are sure to enjoy the experience of diving. Making sure you go to a licensed dive school to train is a must as it will benefit you if you are at a beginner level. It is also reassuring to know that you are diving with an experienced professional, whether you are in an indoor pool or out in the sea. Now we have explored deep sea diving, have you found that your opinion on it has changed in anyway? Since reading this have you signed yourself up to a class? How did it go? Or are you a seasoned professional and want to share your tips and tricks to getting the most out of diving? Let us know over on our social media pages and we would love to find out more! This article was written by Loren Astbury for Sports Fitness, shop with us for all your ladies, men's and kid's swimwear as well as goggles and other swimming accessories.